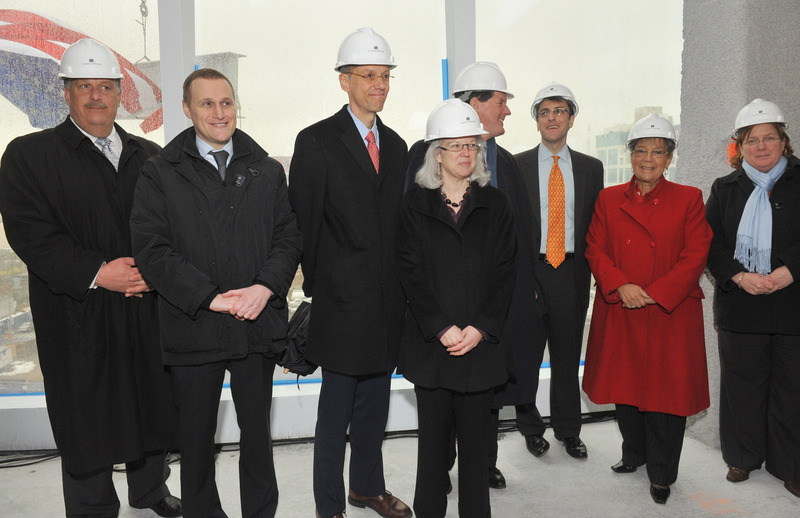 February 24, 2010 – Tishman Speyer President and Co-CEO Rob Speyer welcomed Queens Borough President Helen Marshall, Deputy Mayor for Economic Development Robert C. Lieber and Deputy Mayor for Health and Human Services Linda Gibbs and a host of Queens and citywide government, labor, civic and business leaders yesterday for a ceremony celebrating the “topping out” of Two Gotham Center, a 21-story mixed use tower in Long Island City. Other notable participants in the ceremony included New York City Health Commissioner Dr. Thomas Farley, New York City Economic Development Corporation (NYCEDC) President Seth Pinsky and New York City Building & Construction Trades Council President Gary LaBarbera. During the ceremony, members of Ironworkers Local 361 raised the final beam of steel, which was signed by construction workers and dignitaries in attendance, to a height of 325 feet. The office portion of the 662,000 square-foot, Class A office tower, which is being developed by Tishman Speyer on the corner of Queens Plaza and 28th Street, will be occupied by the New York City Department of Health (DOH). Once the tower is completed in early 2011, the DOH will begin relocating staff members from many of its 15 Manhattan locations. The $316 million project, which replaces the Queens Plaza Municipal Parking Garage, also will include approximately 8,000 square feet of ground-floor retail space and 160 parking spaces. The tower is the first phase of the proposed 3.5-million-square-foot Gotham Center development. This initial stage is responsible for the creation of about 1,400 construction jobs. Long Island City is already home to an array of corporate tenants, including Citigroup and the UN Federal Credit Union. In addition, the Bloomberg administration is undertaking substantial capital improvements around Queens Plaza and Court Square that will make the area more attractive to businesses and inviting to residents. The project includes a new public plaza, new plantings, lighting, street furniture and a public median from Queens Plaza to Court Street and a greenway from Queens Plaza to the East River. These improvements, combined with its proximity to Midtown Manhattan and accessibility to seven different subway lines and numerous bus routes, will serve to attract new businesses. Tishman Speyer was selected to acquire the property and develop the project as a result of a Request for Proposals issued by NYCEDC. The New York City Employees’ Retirement System and the Teachers’ Retirement System are committing up to $9.3 million each in equity towards the project. Designed by Moed De Armas & Shannon, Two Gotham Center will incorporate green building technology and is anticipated to achieve LEED Silver Certification from the U.S. Green Buildings Council for its interiors, as well as LEED Gold Certification for its core and shell. Key members of the development team include architect of record Gensler; construction manager Bovis Lend Lease; structural engineer Cantor Seinuk; and mechanical engineer Jaros, Baum & Bolles. Tishman Speyer is one of the leading owners, developers, operators, and fund managers of first-class real estate in the world. Since 1978, Tishman Speyer has acquired, developed and operated over 325 projects totaling over 116 million square feet and a property portfolio of over US$54.2 billion in total value across the United States, Europe, Latin America and Asia, including signature properties such as New York’s Rockefeller Center and Chrysler Center, Berlin’s Sony Center and Torre Norte in São Paulo, Brazil.